So, I think I have found my something new for the fall/winter. 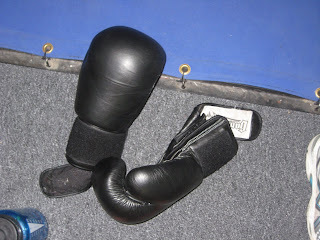 Last night, I tried cardio Kickboxing. That's Kickboxing, with a capital K. Actually it was so hard, so intense, so physically demanding that it probably deserves all caps. And maybe an exclamation point. The first cardio KICKBOXING! class was free just to try it. That sounds good, right? Except that within the first five minutes, I was ready to leave. We started out doing cardio. Now keep in mind, this class is not taught by some Barbie at the local Y. I was at a certified mixed martial arts school. There was a boxing ring, a fighting cage, a floor full of full-length punching bags, and about 100 people running around with different colored karate belts on. Our instructor started class off by jokingly suggesting we call him Satan. Except that he wasn't joking, and by the end of the class, I had a few other names in mind for him (he was actually a really really nice guy). And let me also say - in case Satan barking at me wasn't enough, my three month pregnant friend that let me tag along with her to the class was not making me feel any more in shape. Of course, she's been doing this for more than three years, so she's damn good at it. But watching a pregnant lady with a baby pooch outpunch and outkick you? Humbling. So as I said, we started off doing cardio. I don't care how many miles a half-marathon may be, that was some intense cardio. Running in place, up and down drills, jumping jacks, lunges, etc. and in very rapid succession. My heart rate was very very up. The rest of the class was one big blur of jabs, crosses, hooks, sidekicks, switch kicks, and knees. Satan taught us different drills to perform: for instance - jab, jab cross, jab cross kick, jab cross. We would do them at a normal pace, then he'd have us do them as fast as we could, which for me was the same if not slower than the normal pace. 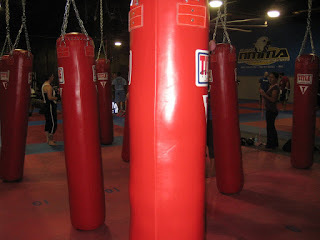 We punched and kicked and kneed those bags for probabaly 40 minutes. For "rest" in between exercises or while he was showing us the next drill, Satan would have us doing squats or running in place. It was intense, but when I was trying my hardest, Satan told me I was doing well. Then it was ab time. My pregnant friend did sit that part out but it was the only part she didn't do. We worked all lower abs for about 5 minutes while Satan roamed among us making sure we weren't cheating. After class, Satan and I talked about cost, class availablity, etc. I'm still debating about if I want to take the class, but I think it might be something fun to do through the fall and winter. If I'm being perfectly honest, cost is not the issue; my weakness/lethargy is. Running can be very easy or very difficult, depending on the course and your mood. I don't think anything about this class could ever be easy. But I will tell you this - the endorphin rush I had in the hours following the class was out of control. It was the happiest I had been in a while. I think I was bouncing. The soreness is setting in. Satan told me it would be worse tomorrow than today so I am going to pop some trusty ibuprofen tonight. If I am able, I might go back to the class tomorrow just to see if I can actually handle it. But, as with the other classes, if anyone wants to take this one up with me, let me know. I am pretty sure my pregnant friend will have to hang her gloves up before too long.